A shelf that fits into the Front Runner Gullwing Box for the Land Rover Defender TDI/TD5. Use these shelves to create different sections in the Gullwing Box for storing goods, crockery and supplies. Shelf made from plywood and powder-coated mild steel. Up to 6 of these shelves can be used in a gullwing box. 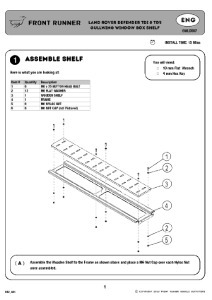 Shelf has slots cut in to allow for various fixing straps or elastic straps to be used to secure plates or other items.